I had the pleasure of working on the Men’s Health Grooming Awards again this year. I’m humbled by the opportunity and I’m thankful to Brian Boye for making it possible. Voyage d’Hermes – Sophisticated…powdery, peppery, sweet, musky. It’s even better on the skin. Add it to your summer collection. Azzaro Chrome Sport – I don’t usually like “sport” scents but this is not your typical sporty scent. For me, it’s a great no-brainer choice for running around on the weekend. A definite head turner at the farmer’s market. Tom Ford Grey Vetiver – Fresh and thorny…the pepper notes give this clean scent depth. 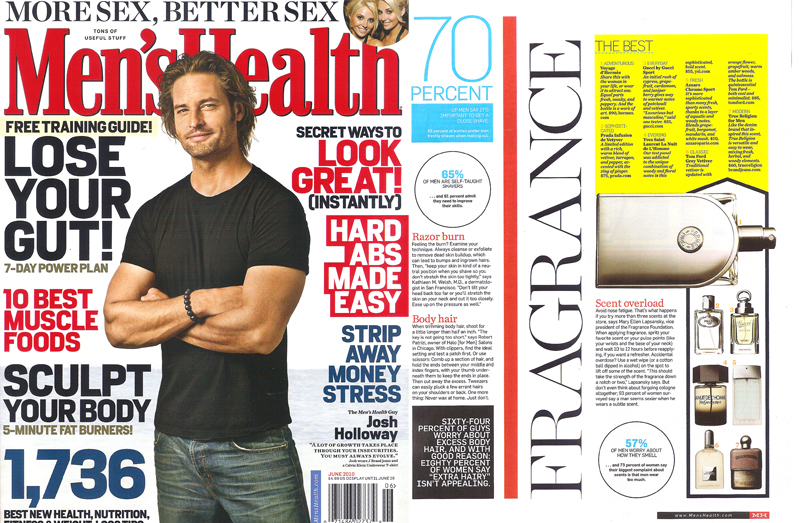 Pickup a copy of the June issue of Men’s Health…it’s on newsstands now. This entry was posted in Press and tagged Azzaro Chrome Sport, Brian Boye, Grooming Awards, Hermes, Men's Colgone, Men's Fragrances, Men's Health, Men's Scents, Tom Ford, Voyage d'Hermes. Bookmark the permalink.